Nails are shaped and buffed, your hands are pampered with a light, warm lotion treatment. Finish it off with your choice of polish. All the benefits of our classic manicure with an added touch of relaxation. Your hands are soaked in an honey almond bath, then soaked in warm towels. Then a pampering and conditioning treatment to melt away stress. Then finish it off with your choice of polish. This treatment includes a warm soak with moisturizing and essential oils. Our organic services leave your skin feeling refreshed and revitalized naturally without any toxins. Nails are shaped and buffed followed by a revitalizing cream massage. Finish off this experience with your choice of polish. Your hands are pampered with a warm lotion treatment designed to provide extra moisturizing for dry, brittle nails. Nails are shaped and buffed followed by a revitalizing cream massage. Finish off this experience with your choice of polish. 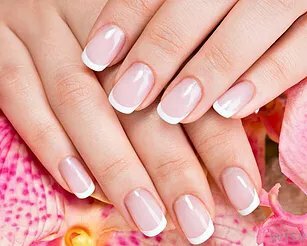 Your natural nails are lengthened with tips, and a thin layer of acrylic is applied. This service requires an acrylic fill-in every 2 weeks. The re-growth area of your nail is blended in and fresh acrylic is applied. This service requires a 2 week fill-in. Original polish is removed, and nails are shaped and buffed. Finished with your choice of polish. This revolutionary new polish applies like regular polish but acts like a gel. Nails are completely dry when you leave and your manicure will last twice as long. This polish can be applied on natural and artificial nails. This treatment includes a warm foot bath of moisturizing and essential oils. Our organic services leave your skin feeling refreshed and revitalized naturally without any toxins. Nails are shaped and buffed followed by exfoliation of the bottoms of the feet. Finish off this experience with our homemade sugar scrub and a revitalizing cream massage. Your feet soak in special softening warm water treatment. Your feet are exfoliated of dead skin, then your nails are shaped and buffed. Finishing it off with your choice of nail polish. All the basics of a classic pedicure, but with a touch of luxury. A deep dermal wrap is applied to the feet to help with skin rejuvenation and exfoliation. Your feet are then eased into warm towels that soothe away aching muscles. Then finish it off with your choice of polish.